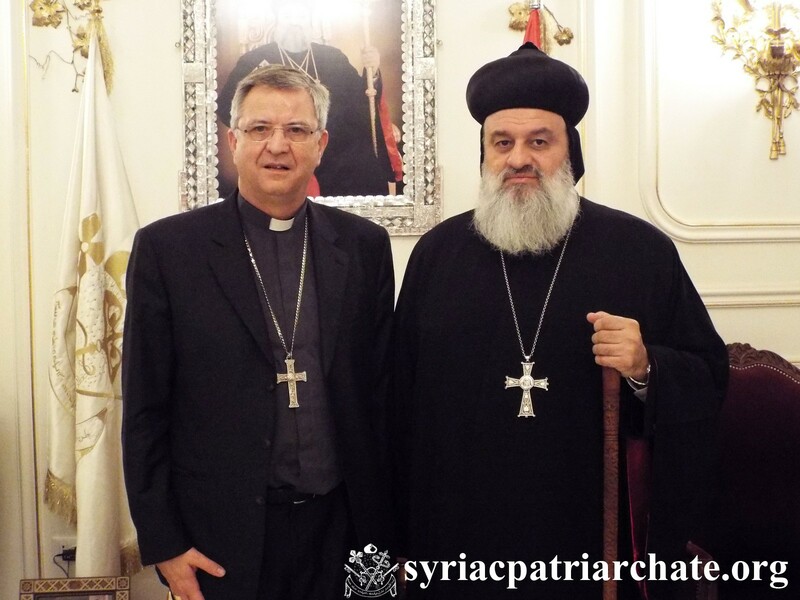 His Holiness Patriarch Mor Ignatius Aphrem II visits the Governor of Deir ez-Zor Mr. Mohammad Ibrahim Samra, at the Governate headquarters. 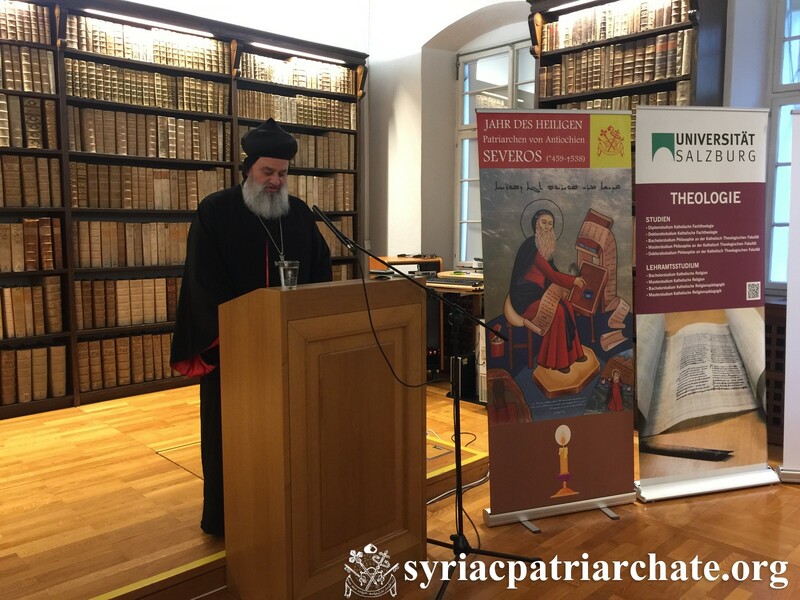 He was accompanied by their Eminences: Mor Maurice Amsih, Archbishop of Jazeera and Euphrates, and Mor Timotheos Matta Al-Khoury, Patriarchal Vicar in the Patriarchal Archdiocese of Damascus, Very Rev. Raban Joseph Bali, Patriarchal Secretary and Media Office Director, Rev. Fr. Gabriel Khago, and Deacon Imad Syryany. The Governor welcomed His Holiness, and expressed his great appreciation for this historical visit, with all the support it provides to the citizens of the city. He also thanked the Syriac Orthodox Church for opening a clinic in the city, and helping people regardless of their religion or ethnicity. His Holiness thanked the Governor for his welcome, and congratulated him for the victory of the city. He reassured that the church will always stand by the side of all who are affected by the crisis, and wished that the city recovers so soon. 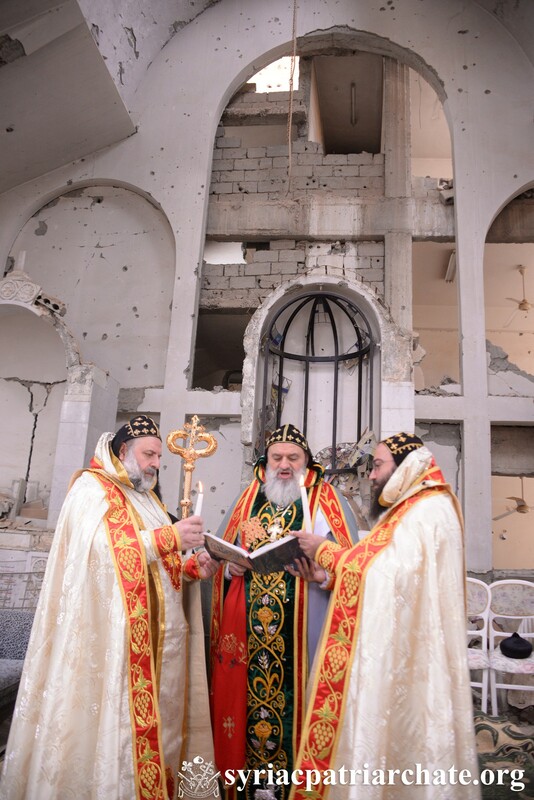 His Holiness Patriarch Mor Ignatius Aphrem II examines the destruction in the city of Deir ez-Zor. The Governor of Deir ez-Zor Mr. Mohammad Ibrahim Samra was also present, as well as several religious and political figures. His Holiness examined several churches and mosques as well as the two main destroyed bridges which connect the city with the east branch of the Euphrates. 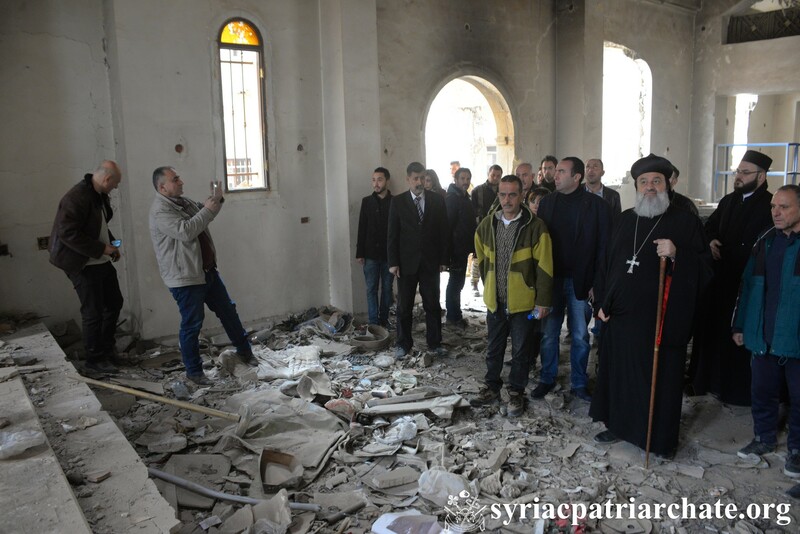 During his visits, His Holiness expressed his hope that the city will be rebuilt again. 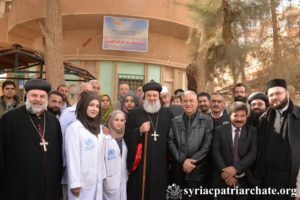 His Holiness Patriarch Mor Ignatius Aphrem II inaugurated St. Ephrem Charity Clinic in Deir ez-Zor in the presence of His Excellency the Governor of Deir ez-Zor Mr. Mohammad Ibrahim Samra. 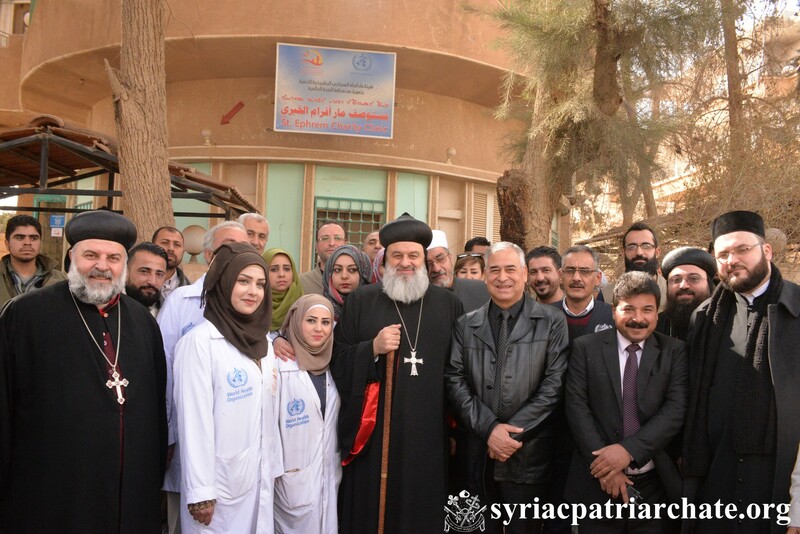 The clinic is a common project between St. Ephrem Patriarchal Development Committee (EPDC) and World Health Organization (WHO), and is the first of its kind in Deir ez-Zor after the crisis. The clinic offers free medicine and medical services to all citizens. His Holiness prayed that the Lord may bless the clinic, its administration, doctors, and all those who work in it or come to it seeking medication. He then made a tour in the different sections of the clinic. 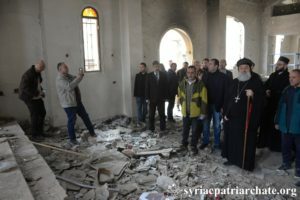 His Holiness Patriarch Mor Ignatius Aphrem II examines Virgin Mary Syriac Orthodox Church in Deir ez-Zor after its destruction by terrorists. 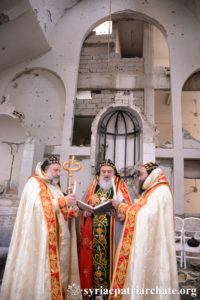 His Holiness Patriarch Mor Ignatius Aphrem II celebrated the first Holy Qurobo over the ruins of Virgin Mary church in Deir ez-Zor, after the city’s liberation. The Governor of Deir ez-Zor Mr. Mohammad Ibrahim Samra, received His Holiness and the accompanying delegation at the airport. 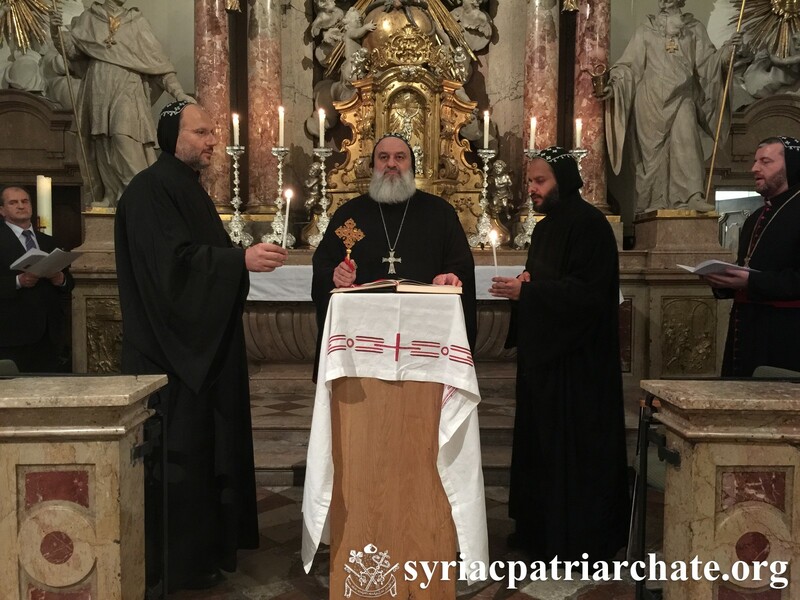 His Holiness was assisted by their Eminences: Mor Maurice Amsih, Archbishop of Jazeera and Euphrates, and Mor Timotheos Matta Al-Khoury, Patriarchal Vicar in the Patriarchal Archdiocese of Damascus. The Holy Qurobo was attended by several religious figures, as well as the faithful who started to return back to the city. In his sermon, His Holiness thanked the Lord that the irregular situation in the city has come to an end, and expressed his deep sorrow to see destruction everywhere, especially that churches, mosques and all kinds of buildings were destroyed by terrorists. However, His Holiness assured that his visit to the city is a vivid message to all evil hands that we are the children of life, and that Syria will recover no matter what. He also expressed his solidarity with all families and citizens of the city who lost their beloved ones or their houses and works, and assured them that the church will always try its best to help them. His Holiness also expressed his sadness to celebrate the Holy Qurobo over the ruins of Virgin Mary Church. 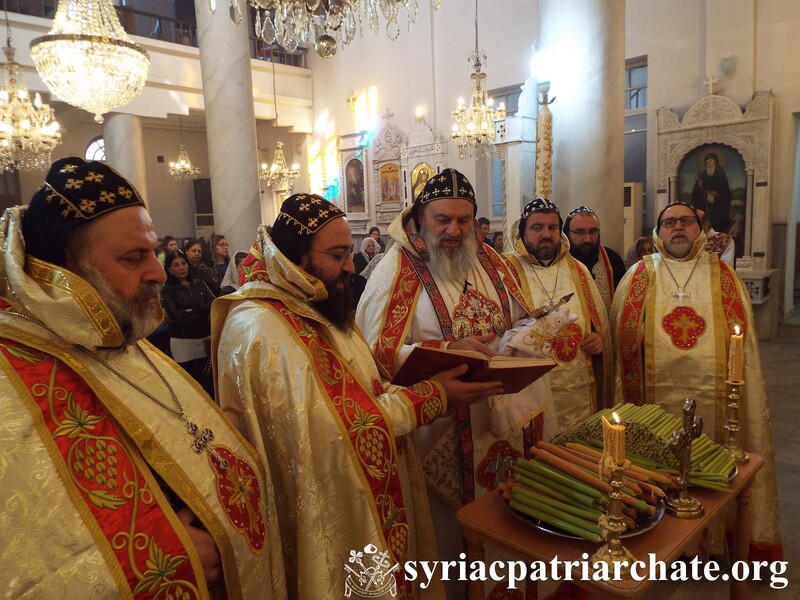 His Holiness Patriarch Mor Ignatius Aphrem II celebrated the Holy Qurobo on the feast of the Presentation of our Lord to the Temple, at St. Georges Patriarchal Cathedral in Bab Touma – Damascus. 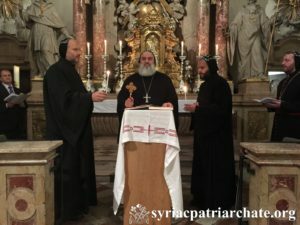 He was assisted by their Eminences: Mor Timotheos Matta Al-Khouri, Patriarchal Vicar for the Patriarchal Archdiocese of Damascus, Mor Selwanos Petros Al-Nemeh, Metropolitan of Homs and Hama, Mor Dionysius Jean Kawak, Patriarchal Vicar for the Archdiocese of Eastern United States, and Mor Maurice Amsih, Archbishop of Al-Jazeerah and Euphrates. In his sermon, His Holiness spoke about Simon the elder who gave us an example by his strong trust in God an His promises. He also emphasized the importance of following the Lord’s commandments and abiding by the church laws, as our Lord and Savior did. His Holiness spoke as well about the faithfulness of Mother of God Mary and St. Joseph. During the Holy Qurobo, His Holiness presided over the rite of blessing the candles. 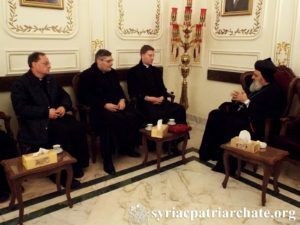 His Holiness Patriarch Mor Ignatius Aphrem II received a delegation from the Catholic Church in Germany, at the Patriarchate headquarters in Bab Touma – Damascus. The delegation is on a humanitarian visit to Syria. It includes: Fr. Peter Fuchs from Munich, Fr. Stefan Dreher from Stuttgart, and Fr. Michael Theuerl from Berlin. His Holiness welcomed his guests and discussed with them issues related to the current situation in Syria, and the humanitarian work done by our patriarchate to help relief the people affected by the current crisis.